Today we have two projects to share. First up is Nancy with one of our fun altered art pieces. This piece can be decorated to suit any number of themes. Hi everyone, Nancy here! I had so much fun decorating this Stage. I love anything to do with the sky, stars, moon and all things celestial, so I thought I'd call my creation "Reach For The Stars". I added lots of textures to this piece with chunky glitter, glass beads, bead gel, shabby embossing powders, mica, gilder's paste, etc. Next up is Veronica with a gorgeous vintage styled banner incorporating lots of fun chipboard shapes! Hello Everyone! Veronica here, to share with you Gina's lovely C-R-E-A-T-E Dovetail Banner. I added Gina's Doily Intricates to give the letters some pop. Here is a her Butterfly Of Gears. Just adds a creative feel to the banner's theme. Here I added one of Gina's String Alongs this one is" Sewing", and of course I couldn't finish without one of Gina's wonderful Flourishes Miniatures! Welcome!!! Welcome!!! Welcome!!! Shanna here sharing a super fun and amazing project I recently created. I used to be a beach bum and was at the beach daily, but where I live now the beach is 3 hours away!!! I have sworn to bring the beach to my home, and so far my fireplace mantle and one bathroom has been beached out! Now for the powder room. I decided to create this specifically to decorate my powder room so people have something to gaze at besides a sink. 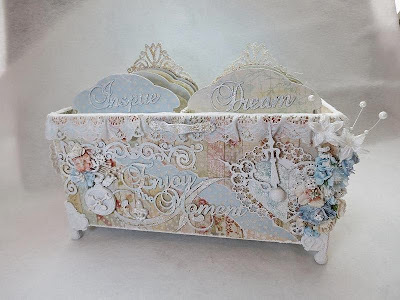 The memory tray got a couple coats of a cream colored acrylic paint and the chipboard pieces got a coat of gesso. After the gesso on the chipboard dried I added some glass bead gel and color by spray or chalk ink. Yes there must always be rules even if they are just for having fun! Hi everyone and happy Friday! For me weekends are all about family, so today I would like to share with you my Family Photo Cube I have created featuring photos of my Grandson Brayden. I used some of the Prima Cartographer paper on this cube, and there are lots of images of hot air balloons on the paper, so it worked out great with Gina's Net Style Hot Air Balloons which I have used on the top of the cube. I also used some of the Border & Corner Gear Miniatures along the side of the balloon, and a wooden sentiment from my stash that says Our Family. Above here you can also see the photo on the front and I have used some of the Art Deco Corners, embossed in black, for photo corners. I finished it off with some flowers and a metal zipper. Below here you can see some photos of my beautiful Grandson Brayden. I have placed his photo inside some of the new Word Frames. The first one says "moment", and on the opposite side of the cube, I have one which says "family". I used another of the Border & Corner Gear Miniatures, a metal arrow and flower in the corner of the frame. I wanted to keep it simple, to make the photo the star of the show. Below here is a close up of the Deco corners, they make perfect photo corners for projects, I just love how they turned out and they hold the photo perfectly! I hope you will try making your own family photo cube, this was a lot of fun to create! Hey everyone! Shanna here today to share with you a wall art piece. I had so much fun playing with the key. My thought was to make it an inspirational piece: "The key is to treasure the voyage." First I painted everything black. Then I decided to paint the balloon along the lines of teal and vintage metals. I then altered the gears by doing a layer of gesso, layers of Twinkling H20's and then adding some Glass Bead Gel, completing the gears some Tattered Angels Paints. The base of the key got a layer or Croco Paint giving it that old metal rusting off look. Then I finished off the key with metal flowers and some chit chat pieces. Good morning everyone, Shanna here. I have a special layout that I made for Gina's Designs. More importantly I made it for my mom. Of course having two grandbabies she had to share the love equally. I made a layout of my daughter for my mom for Mother's Day so it is only fair to equal it out and make her one of Avery. I so love the Pink Paislee papers I used and the amazing chipboard pieces that really helped make this layout pop! Hi Everyone, and Happy Friday! 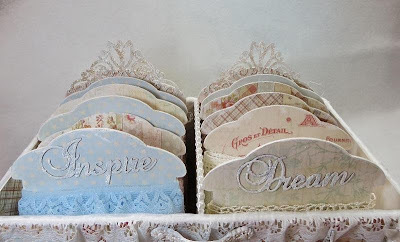 Today we have Guest Designer Bonnie, who has created this stunning Trim Organizer. 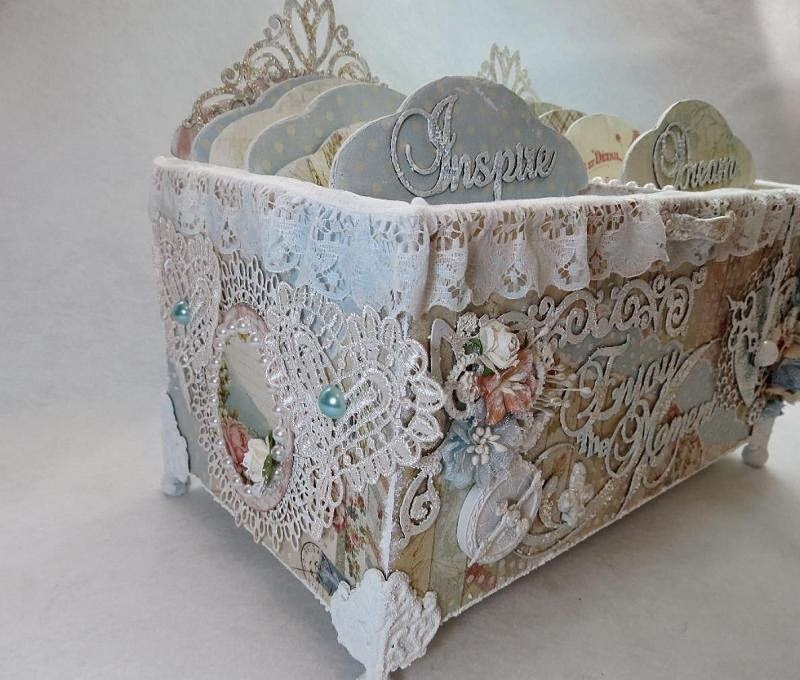 She has created something very beautiful, and used several of our chipboard items to decorate it. You can see above here that Bonnie has created a lovely shabby vintage look and used some of the words and phrases, cardstock doilies, clock hands, tulip scroll corners and even half of a steampunk heart on the right hand side and adorned it with some beautiful flowers as well! Here are more of the words and phrases used on the lace spools that come with the trim organizer, and she has also added some more of the tulip scroll corners in the back. 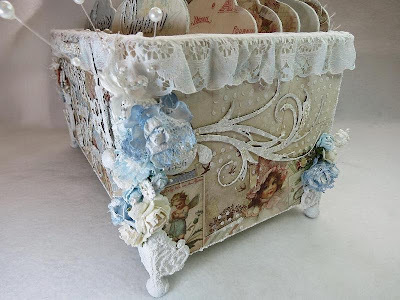 Here is a side view of the box, where Bonnie has decorated it with one of our flourish pieces and more lace and flowers. She has added some feet to the bottom of the box for a finishing touch. Thanks so much Bonnie we just love it! Shanna here today to share a cool new project I created. This is a Vintage Camera Box and a great home decor piece to alter for anyone and any theme. I altered it using some Prima papers and flowers. Everything was also inked with Vintage Photo Distress Ink. This was such a quick and easy project to put together. Thanks so much for stopping by.